Right on the golden sands of Cabarete Beach is where you can find the Azzurro Club Cabarete. 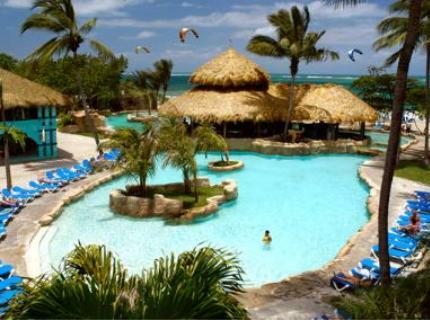 That means that this all inclusive Dominican Republic resort is just 20 minutes from the Puerto Plata International Airport and approximately 45 minutes from the city of Puerto Plata. The area in general offers up many options for things to do, such as shopping and golfing, and Azzurro Club Cabarete guests can find plenty of things to do at the resort itself. As is true of many all inclusive Caribbean resorts, the Azzurro Club Cabarete offers a daily activities program that guests can take advantage of. It also offers evening entertainment, often in the form of shows and musical performances. Among the activities of choice during the day are kayaking, snorkeling, and boogie boarding. Guests can also play ping pong, go for bicycle rides, indulge in a little beach volleyball, take an introductory kite lesson, or do some windsurfing, among other things. Cabarete Beach is actually considered to be one of the world’s best windsurfing beaches. So many things are included in the all inclusive rates at the four star Azzurro Club Cabarete. Should guests so desire, they can opt to pay extra for such things as room service, massages, horseback rides on the beach, tours, and rounds of golf at world-class courses like the Playa Grande and the Playa Dorada. Both of these courses were designed by Robert Trent Jones, it should be noted. As for the 108 Azzurro Club Cabarete guest units, they offer plenty of comfort and are equipped with a variety of welcoming amenities that make it easy for guests to get comfortable. Cable TV and mini fridges that are stocked daily with water, soda, and beer are among the amenity highlights.